Clockwise, from top left: curly kale, Brussels sprouts, celery, watermelon radishes, carrots, turnips, sweet potatoes, Napa cabbage, and baby lettuce spring mix. Welcome to Week 10 of our 12-week Fall and Winter season. This is our 34th consecutive week of providing veggies to northeast Mississippians in 2017, and what an awesome journey it has been! 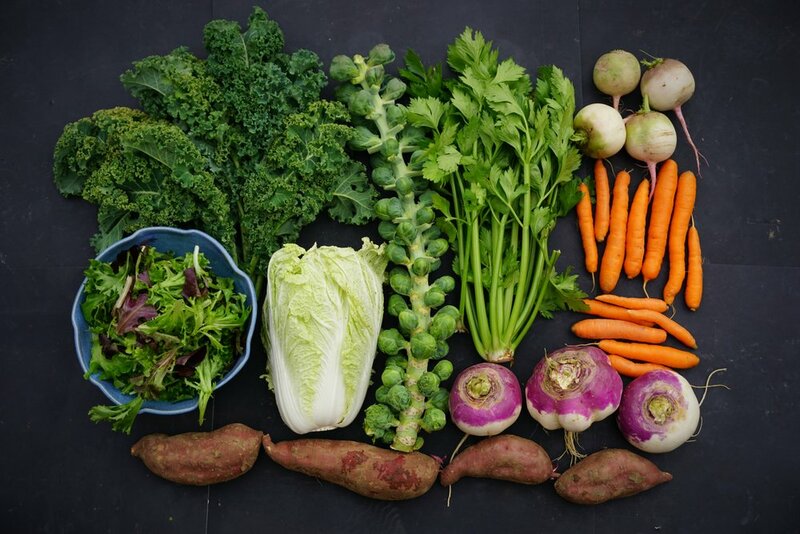 In preparation for the impending cold weather we are working to bring in lots of our bulk root crops—think carrots, turnips, and radishes of all colors and shapes. We have over 4,000 pounds of carrots already harvested and in cold storage, and we are running out of space in our walk-in coolers to fit all of the root veggies we have coming in from the fields. What an awesome dilemma! I love the abundance associated with growing winter storage crops. It is true that #smallfarmsfeedcommunities. The simple meals made from these fall vegetables are wonderful. It makes me happy to share the bounty and abundance of our gardens with y'all, and we look forward to doing it all again next year. Our 2018 discounted early-bird sign up will open this Wednesday and run through December 31st at midnight. Sign-up here. 1) Cleaner veggies. We are having a vegetable wash line custom built in Pennsylvania to make your CSA veggies even cleaner! Hello, washed potatoes and sweet potatoes. 2) A private members-only Facebook group to share recipes, inspire new meals and link up with other chefs in the CSA. 3) CSA coaching through the Facebook group with video cooking tutorials, veggie storage tips, and advice on how to make the most of your share. 4) Return of the swap table. Can't use all the okra? Trade it our for some more tomatoes! 5) Know the share contents of your share the Sunday before each week. Plan your weekly meals in advance! 6) Ability to purchase more local products at the farm stand. More information will be coming on this soon! 2018 Discounted Early-Bird Sign Up Opens This Wednesday. Sign up here.